The 2015 Brian Green Property Group New Zealand Rally Championship is reaching a pivotal point as teams head to the penultimate round of the series this weekend at the Mahindra Gold Rush Rally of Coromandel. Championship leader Ben Hunt and co-driver Tony Rawstorn hold a 42 point lead over their closest challenger Phil Campbell and co-driver Venita Fabbro making this weekend’s event a crucial round for both teams. Nelson Subaru team Hunt and Rawstorn are the form pairing in the championship at present with back to back victories in the last two rounds at Canterbury and Gisborne extending their championship lead. Tauranga Mitsubishi driver Campbell has been the season long challenger to Hunt but retirement due to a mechanical issue at the last round in Gisborne has dented his title chase meaning a top point’s score is vital at Coromandel to keep his chances alive. With teams able to drop their worst points score from one of the first five rounds, Campbell has the opportunity to close the gap to Hunt at Coromandel and set up a showdown at the season finale Rally Wairarapa. Campbell will take confidence into the event however having secured his maiden NZRC round victory on the Coromandel Peninsula last season and winning his home event the Tauranga Clubman’s rally a three weeks ago. “It was a disappointing end to our rally at Gisborne, but since then we’ve run the car at our home event and had a good clean run so are feeling confident heading back to Coromandel and continuing the pace we’ve had in the championship to date,” stated Campbell. Third in the championship and within striking distance is Te Aroha Subaru driver Lance Williams and co-driver Crunch Bennett. 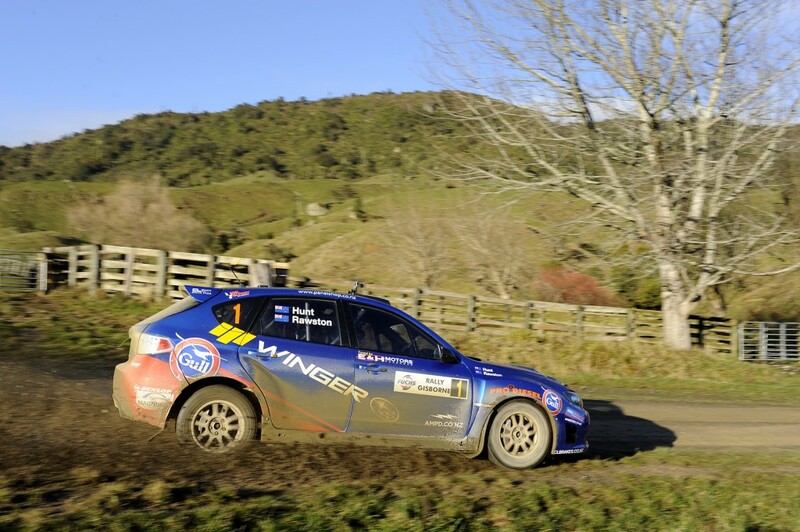 Celebrating his 21st birthday on the same day as the rally, Williams produced a fast mature drive at Rally Gisborne to finish second overall. Fellow Subaru driver Matt Summerfield (Rangiora) sits fourth in the points standings and along with Williams both will be looking to cement podium positions ahead of the championship finale. Returning to the championship and carrying the hopes of the locals will be Coromandel’s Alex Kelsey in his radical Mad Creation 2. The car designed and built by Kelsey and featuring a V6 powered 4WD drivetrain cloaked in a Peugeot 208 body has been an outright pacesetter and Kelsey with co-driver Malcolm Peden will be a real contender on home roads. Tauranga Mitsubishi driver David Holder also makes a welcome return in his ex-Hayden Paddon Mitsubishi Lancer Evo 8. Tipped as a championship front runner in 2015, Holder crashed out of the opening round at Whangarei while in podium contention, a full rebuild of the car by his team has been carried out and Holder will be aiming to get back onto the pace on his return. The high quality championship field also includes Dunedin’s Emma Gilmour (Suzuki Swift), Dylan Turner (Auckland – Mitsubishi), Graeme Featherston (Te Aroha – Mitsubishi) and the much anticipated debut of Shannon Chambers exciting new Volkswagen Polo. Leading the class battles are young Hawkesbay driver Max Bayley (2WD), Kaiapoi’s Marcus Van Klink heads the BNT Historics in the spectacular Group B Mazda RX7 while a three way battle is brewing in the Gull Rally Challenge 4WD with Tyler Radovan currently leading Kingsley Jones and Richard Bateman. The Gull Rally Challenge 2WD is headed by Justin Glavish from defending class champion Jeff Torkington. The Whitianga based event will be contested over 135 kilometres of gravel roads on the Coromandel Peninsula, the battleground for competitors includes stages at Castlerock, Tapu Coroglen and the renowned Coromandel ‘309 Road,’ a mix of demanding technical sections through the twisting ranges to fast and flowing runs towards the coastline. The event which has again generated fantastic support from the Thames Coromandel District Council features a bumper 36 car championship field among the full field of 58 entries. The Mahindra Gold Rush Rally of Coromandel commences with a Rally Show, driver autograph session and Ceremonial Start on Blacksmiths Lane in Whitianga on Friday evening from 4.00pm. Saturday’s competitive action gets underway with the first special stage at 7.10am with a total of 135 kilometres of competition covered before the victory celebrations will be held from 4.15pm back in Whitianga following the completion of an afternoon tarmac superspecial stage on Joan Gaskell drive in Whitianga. The Mahindra Gold Rush Rally of Coromandel provides great spectator viewing opportunities with a number of Spectator vantage points. A rally map is available free to download from the event website http://www.rallynz.org.nz/2014-goldrush-rally-of-coromandel or it can be collected from Rally HQ at the Mercury Bays Sport Complex, or one of the Tourist Information Centres on the Coromandel. Spectators are reminded to follow the instructions of marshals and ensure they stand well clear of the road’s edge – inside the taped off viewing areas.